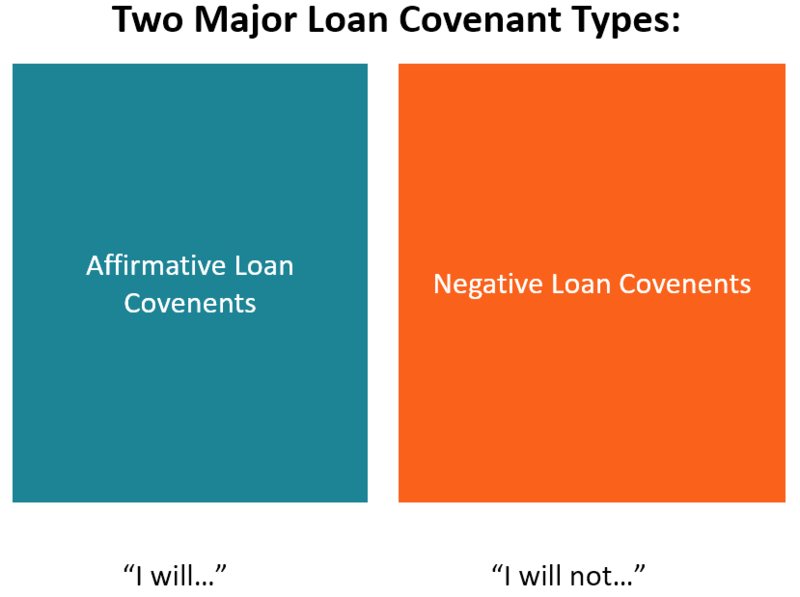 What is a Loan Covenant? A loan covenant is an agreement stipulating the terms and conditions of loan policies between a borrower and a lender. The agreement gives lendersTop Banks in the USAAccording to the US Federal Deposit Insurance Corporation, there were 6,799 FDIC-insured commercial banks in the USA as of February 2014. The country's central bank is the Federal Reserve Bank, which came into existence after the passage of the Federal Reserve Act in 1913 leeway in providing loan repayments while still protecting their lending position. Similarly, due to the transparency of the regulations, borrowers get clear expectations of the lenders. The loan covenant allows borrowers to prepare for their repayment before and during the agreement. However, in case a borrower defaults in payment or breaches the covenant, the lender is entitled to claim the sum of the loan in full. The covenant makes sure that (1) the lenders’ rights are secure, (2) there is a reliable mechanism to rectify the process, and (3) there is a clear illustration of events leading to the borrower’s default. In loan covenants, there are three commonly known types of agreements: affirmative loan covenants, negative loan covenants, and financial loan covenants. Affirmative loan covenants remind the borrowers that they should perform expressed activities to maintain a healthy operation of their businesses, which will in return create a stable financial performance. However, in breach of this covenant, the borrower will be in default on his/her obligations. As a result, the borrower may receive a grace period to fix the violations or worse, the lender may announce it as a default and thus demand full repayment. The lenders expect the borrowers to perform their tax obligationsAccounting For Income TaxesIncome taxes and its accounting is a key area of corporate finance. Having a conceptual understanding of accounting for income taxes will allow a company to to maintain financial flexibility. Tax is an intricate field to navigate and often confuses even the most skilled analysts. to both the business and towards their employees. The lenders expect that the borrowers will maintain credible and verifiable books of accountsThree Financial StatementsThe three financial statements are the income statement, the balance sheet, and the statement of cash flows. These three core statements are intricately linked to each other and this guide will explain how they all fit together. By following the steps below you'll be able to connect the three statements on your own.. The requirement enables the lenders to be able to ascertain the health of the borrowers’ finances each financial yearFiscal Year (FY)A fiscal year (FY) is a 12 month or 52 week period of time used by governments and businesses for accounting purposes to formulate annual financial reports. A Fiscal Year (FY) that does not necessarily follow the calendar year. It may be a period such as October 1, 2009 – September 30, 2010.. The lenders expect the borrowers to obtain dependable insurance policies for their businesses and at least extend it to the lenders as an additional insured party. To run a business in a bearable business environment, the lenders expect the borrowers to maintain a reliable working relationship with their respective states by enforcing and abiding by the laws. Sometimes, the lenders may want to create a firewall around all major financial and ownership decisions made by the borrower. To achieve this, they ensure that they own rights to notifications like alterations of capital structureCapital StructureCapital Structure refers to the amount of debt and/or equity employed by a firm to fund its operations and finance its assets. The structure is typically expressed as a debt-to-equity or debt-to-capital ratio. Debt and equity capital are used to fund a business’ operations, capital expenditures, acquisitions,. As a result, it streamlines the borrower’s credibility and also lowers the chances of defaulting. For such reason, therefore, it’s important for businesses or borrowers to get a deep understanding of the terms of the loan covenants to ensure they don’t get unintended friendly cross-fires since lenders do not intend to lose their investment. A clear stipulation that the lenders possess the right to prevent mergers or acquisitions without proper notification or full knowledge of the process. The covenant includes a clause that prevents the borrower from investing without the lender’s permission. Similarly, there is a clause that prevents borrowers from writing-off or selling assets without proper lenders’ notification of the transaction. The borrower must keep check of debt ratios related to service coverages. The lender may bar the borrower from exercising stock practices like distributing and paying the shareholders. Financial loan covenants keep a guard over whether the borrower is reaching or closely attaining the targets of the estimates provided to the lender. Therefore, the closer to the targets, the more satisfied is the lender. Similarly, the farther from the actual projections, the more likely the borrower may default. Therefore, to be on the safe side, lenders may provide restrictions on the amount of credit the borrower may access at a given period. Below are the details. The lender may continuously monitor the borrower’s current ratio to ensure it stays relatively attractive and promising. The financial loan covenant gives a clear guide on how low or how high a borrower may carry a credit. Extension of the period of submission – In the event, the borrower fails to submit books of accounts on time, the lender, under stern warnings, may extend the period of submission. Offering waiver – On another occasion, out of his/her goodwill, the lender may offer the waiver to the borrower. Debt buybacks – In case the debt is still feasible, the lender may prefer debt buybacks. That is, like issuing weavers, a lender may reduce the principal debt amount to enable the borrower to pay the debt at lower installments compared to the initial amount. Legal agreements – The lender may offer the borrower a forbearance agreement to bind the borrower to state when to pay back the remaining amount in question. Out-of-court settlements – Sometimes, the lenders may not go to the extent of punishing the borrower with court cases. Instead, they may decide to renegotiate the agreement out of court. Amendments – Due to the conditions surrounding the operations of the business, the lender may choose to accommodate the borrower by amending few clauses in favor of the borrower. Providing equity cure – In this kind of dispute resolution, the lender may decide to approach the shareholders to infuse more funds to the business or add extra cash flows. Liquidating the borrower’s collateral – The lender may decide to liquidate the borrower’s collateral held against the loan in case of default. Insolvency – In case the business is no longer feasible, then the lender has no option except to push for insolvency.